SHOHINI is a line of unique, handcrafted jewellery created by Shohini Gupta.This line showcases a rare collection of designs born out an eclectic mix of sensibilities and a surprise at every turn! We create one of a kind or limited edition pieces which are artisanal and rough, edgy in look and feel, with personal artistic touches. They are colourful and unique, bold and fearless, with a strong emphasis on design and wearability. Shohini always had a soft spot for jewellery. Like most girls her age, she would invariably find herself drawn to the jewellery vendors at street corners and fairs. Over the years her personal collection of jewellery collected from different parts of the country has become an obsession. But it is not until a few years ago she decided that she wanted to channel all her artistic learning and sensibilities into creating jewellery. In 2012, she started her own handcrafted jewellery line SHOHINI and since then she has been running her handmade jewellery business on and off the internet. 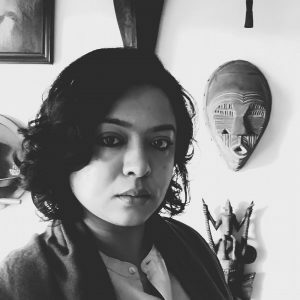 Shohini Gupta is an independent artist and designer with a Bachelors in Fine Arts from Kala Bhavana, Visva Bharati, Santiniketan. Apart from being a jewellery designer/maker she is also a practitioner of various visual and performing art forms. Shohini is also passionate about food and fashion and takes great pleasure in organising and redecorating spaces. She currently lives and works in Kolkata, India.